This is a compelling story of a family in transition and a woman’s advocacy for victims of domestic abuse. 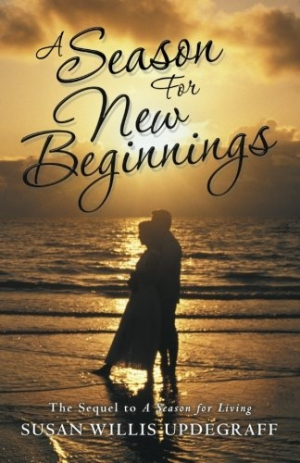 In Susan Willis Updegraff’s compelling A Season for New Beginnings, a tireless advocate who is the founder of a home for domestic abuse victims champions her cause and handles the demands of family life. Despite a childhood marred by abuse, Caroline has forged a happy home life with Garrett, her husband of almost thirty years. Her two children are grown up, and her day-to-day responsibilities at New Beginnings, her shelter, have greatly diminished since a state agency took over running the facility. Caroline is looking forward to spending more time enjoying life, but just as she starts making plans, challenges arise. A riveting opening scene at the domestic abuse shelter has a perpetrator breach multiple locks and silent alarms and attack one of the social workers. The author is adept at describing the many defenses employed by the staff to keep victims safe. Her psychological portrayals of both residents and aid workers are a highlight of the sprawling novel. Starting with Sarah Foster, who shows up on page one “in urgent need of dental care,” the victims’ stories are all captivating. Updegraff effectively illuminates the many obstacles these women must overcome as well as the hurdles their allies face as they fight for the passage of comprehensive legislation. The narrative through-line is domestic abuse work and efforts to implement legislation, but several subplots assert themselves throughout the novel. The Winthrop family must grapple with fundamental issues throughout the book, including abortion, abstinence, alcoholism, the aftermath of 9/11, and how faith can provide solace during harrowing events. These topics are sometimes handled in an off-putting, agenda-pushing way, without growing organically out of the characters’ development. The story stays moving, weaving in the many characters’ stories well. Although Caroline is the central protagonist, several chapters are told from other characters’ points of view. Caroline’s son, John, deals with alcoholism and falls in love; her daughter, Katie, tries to help with his addiction while finishing her senior year at Duke. Her husband, Garrett, receives an irresistible job offer with a United States senator. Caroline must manage many “balls in the air,” as must the text. The transitions between chapters are seamless, and the dialogue reads as true to life. A Season for New Beginnings is a compelling panoramic shot of a family in transition with the mother at the helm, with stories of victims’ rights advocates’ work combating domestic abuse incorporated.